Although used interchangeably, 3rd party online fulfillment (3PF) companies and third-party logistics (3PL) have very different purposes and intended outcomes. These questions have complex answers, especially since many in our industry use terms like “fulfillment services” and “3PL” interchangeably. The root cause of this confusion lies in how third-party logistics has become a genericized label for a whole range of services, most of them actually falling in the “fulfillment” camp. At their core, order fulfillment services and 3PL are quite separate. 3PF services oversee a much larger portion of the supply chain, and they include services like eCommerce, marketing, and program administrative support that are usually handled in-house. 3PF providers essentially become an extension of your operations, allowing you to focus on top-level strategy and growth while knowing confidently that every order will be fulfilled as promised. 3PL, on the other hand, usually tasks you with all of the back office duties while just managing the physical storage of inventory and bulk freight shipment of your orders. To help you further separate the two, we’ll explain the difference between 3PF and 3PL through both succinct and in-depth definitions. What Is Third-Party Fulfillment, In a Nutshell? Third party fulfillment handles every part of the ordering process for the client. The most obvious and important component of their service is ensuring product orders can reach their destination quickly, reliably, consistently, without damage, and in a way that provides a great experience to the end recipient. Fulfillment order recipients can include anyone from franchise partners, peripheral corporate offices, retail partners, or direct-to-consumer orders placed via ecommerce. Unlike third-party logistics, the vast majority of shipments made through a fulfillment service involve discrete qualities of stock, time sensitivity, and highly variable order conditions. There is rarely a single preferred turnkey process that figuratively railroads your shipments into a preferred outcome. Instead, variable conditions and unique challenges are the norm. Every order is a special order in fulfillment. Third-party fulfillment services are also customizable, meaning clients can pick and choose any or all of the bulleted services above. Like many other third-party fulfillment companies, Helm provides additional value-add services outside these core areas. We can also manage your entire fulfillment program, including performance monitoring, budgetary management, peripheral marketing support and more. Think of 3PF as managing a large portion of your ecommerce business for you. Consider how IT as-a-service models provide complete technical support and oversight of systems. With this model, companies don’t have to develop high-salary technical talent or create a department that becomes a cost center. Similarly, third-party fulfillment means you can operate your business without having to focus on using capital to invest in large warehouse facilities, developing complex processes for non-core functions, or implementing expensive technology with a lengthy ROI cycle. As an extra benefit, the deep knowledge and economies of scale 3PF provides can generally surpass even the most expertly managed internal fulfillment programs. Third-party fulfillment companies like Helm have a broader range of experience tackling unique challenges and meeting highly variable demands, making us more prepared to consider every option before implementing the optimal solutions. By streamlining your operations and constantly optimizing your fulfillment performance, Helm can help turn a typical cost center into a profit center. Third-party logistics services help businesses distribute and ship goods in full truck load or container size shipments. 3PL usually oversees multimodal inbound and outbound shipments via truck, rail, air and ocean services. They specialize in arranging long-term shipping contracts as well as order scheduling, routing, and optimal distribution arrangements to ensure more consistent service to major hubs, ports, distribution centers and other critical contact points along the supply chain. Unlike 3PF, where order conditions can be highly variable, 3PL contracts generally aim to standardize shipment processes as much as possible. If you were to ask a 3PL partner to arrange a one-time shipment with 20 different kitted order arrangements, weighing under 10 pounds, and shipped to 12 franchise locations, their most likely response would be a resolute “no”. Logistics generally does not handle direct client interactions, nor is it capable of providing services like database management, kitting & assembly, or white labelled custom packaging. In other words: while fulfillment focuses on the quality of individual orders and the adept management of client operations, logistics looks at the big picture for large supply chains. Instead of worrying about hundreds of diverse orders being routed through multiple carriers in order to satisfy customers and business clients like fulfillment does, logistics concerns itself with intermodal good transfers on a massive scale. So What Is the Ultimate Difference Between Third-Party Fulfillment Companies and 3PL? 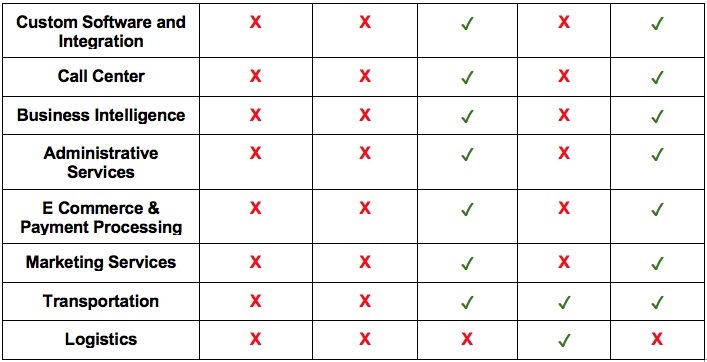 The table below illustrates the different services offered by 3PL, 3PF and Helm’s own capabilities. As you can see, 3PF providers cover a lot of ground, and Helm can offer even more. To put the difference between 3PL and 3PF succinctly: Third-party logistics has a narrower scope that mainly concerns itself with arranging bulk freight orders across many methods of transportation as part of huge, complex supply chain business networks. Third-party fulfillment instead remains focused on processes and services that ensure unique individual orders get fulfilled quickly and profitably to create a repeatable experience that leads to satisfied end recipients. By operating your order processing efficiently and managing all aspects of the supply chain for you, third-party fulfillment partners allow your business to scale quickly without encountering commonly associated growth bottlenecks. Rather than worrying about developing order fulfillment systems or acquiring expensive warehousing capital, you business can simply focus on strengthening its brand and determining how to maximize your promise of value to your customers, clients, and business partners. Third-party logistics, on the other hand, mostly only benefits businesses with generic, repeatable orders shipped via freight. At the end of the day, fulfillment is about people feeling fulfilled and getting the order they needed. Logistics is about routing trucks and creating repeatable processes with the aim of satisfying operations managers and financial goals rather than any particular end recipient. Want to make your fulfillment processes repeatable, reliable, and centered around your customer/client/franchisee’s experience? Take a look at the extensive, highly-tailored order fulfillment services offered by Helm today, and then contact us to start the conversation.